Nitrile or PVC coated gloves with durable cotton support are characterized by higher mechanical strength and resistance to grease and some oil products. These gloves are often used for metal works. 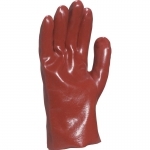 Dual nitrile coating on a firm cotton support insures excellent hands protection when working with rough dry or wet objects and occasional greases. 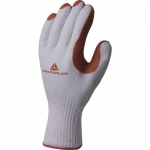 Depending on the kinds of work performed one can use work gloves with knit wrists or safety cuffs, with partial or full nitrile coating. 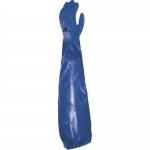 PVC coated gloves on a durable fabric support of extended length (35 or 45 cm) will provide the necessary hands protection for rough abrasive works with aggressive chemicals present.